Anyone who has whinged about Formula 1 being dull needs to think again. For the third consecutive race the action has been fast and furious. Interlagos was the best of the races so far this year with unbelievable drama as around half the field crashing out. The biggest crashes involved Mark Webber, who demolished his Jaguar, leaving wreckage all over the road. Fernando Alonso arrived on the scene and hit one of the wheels and huge accident of his own. Both men emerged bruised and battered by unhurt. Alonso's crash was so bad that the race was immediately red flagged. No-one was quite sure who had won as the stoppage came just as the fuel strategies were unwinding. It looked for a moment that Jordan had pulled off the most unlikely victory for years in F1. In the end Jordan had to accept defeat although the team got plenty of good press. Rubens Barrichello had looked like a possible winner but his race had ended in his car pulling off with what Ferrari called "a fuel pick-up problem". Could it be, the paddock asked, that the local hero had run out of fuel? It certainly looked that way. Michael Schumacher made another mistake and crashed. When the FIA looked at the timekeeping a few days later it was concluded that Fisichella had in fact won and so Kimi Raikkonen, who had collected the trophy in Brazil, found himself with the unpleasant task of having to give it back. The most important influence on the outcome of the 2003 Brazilian Grand Prix can be traced back to a meeting last October between the Formula 1 team bosses. They voted unanimously to change the rules to limit the use of wet tyres to just one specification per event. It was designed, it seems, as cost-cutting measure but the result was some rather big repair bills for the teams. The tyre companies decided that to cover as many options as possible they would take intermediates to Interlagos. The problem was that the torrential rain in Brazil was such that the intermediates were just not effective enough, particularly where there was water flowing across the track. The result was some major crashes in the high speed Turn 3, where water was flowing across the road. By the end of the race there were six cars behind the wall at Turn 3, including the Ferrari of Michael Schumacher, Juan Pablo Montoya's Williams, Jenson Button's BAR, both Minardis and Antonio Pizzonia's Jaguar. There were also near-misses for several racers not least Mark Webber who spun at high speed but somehow managed to catch the car without going into the wall. "I saw the wall was a bit close," Webber said of his spectacular incident. "I steered the car a little and it straightened up the right way. I had the right luck. Luck played a big role in the event. The rainy conditions and the constant use of the Safety Car meant that some unusual strategies were developed not least the "Safety Car Strategy" which saw a couple of teams declare their regular cars forfeit before the race started and switch to the spare. The cars were filled to the brim with fuel and tried to go for a non-stop race. The most successful of these was Heinz-Harald Frentzen who ended up finishing fifth. But would he have been able to go the distance if the race had not been red-flagged. Could he have made it to the finish? One more Safety Car would have done it, his race engineer admitted. In other words "No". This did not stop a lot of people getting very excited about a Jordan victory as Giancarlo Fisichella appeared to have won the race when the red flags came out. Nobody will ever really know. The team called Fisichella into the pits after seven laps. He abandoned his eighth place and had his car team pumped the car full of fuel. He rejoined at the back of the field. Would that strategy have won the race? Fisichella himself was not sure. "Honestly it was on the limit," he admitted. The team refused to give any details, preferring to bask in the glory of what might have been. There was plenty of sympathy for Eddie Jordan. But realistic analysis left many question marks. Other strategies seemed to work well. As one car after another piled into the wall at Turn 3, the Safety Car came and went and there were some clever moves. 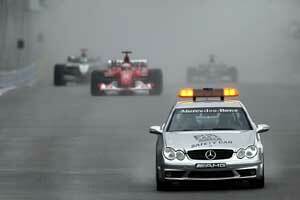 Raikkonen took a gamble and stayed out during the first Safety Car interlude. He only took fuel when the second Safety Car came out on lap 27. Webber took advantage of the third Safety Car on lap 33 and it was clear that from there he could go all the way. He would probably have finished third. But the race result was declared at a moment when the strategies were unfolding and picture was confused. If the race had not stopped McLaren would have scored a 1-2 victory. Of this there is little doubt. In all probability Webber would have been third. The actual result was that Raikkonen was followed home by Fisichella. Alonso was classified third even though he ended the day in an ambulance. Poor Coulthard who was the moral winner ended up a frustrated fourth. The came Frentzen and Villeneuve. BAR provided a much-needed cameo as during the first major pit stop Villeneuve's race was ruined by the fact that he came into the pits behind Jenson Button and lost time while Button's car was refuelled and sent on its way. This dropped Jacques down the order. It was a reverse of what happened in Melbourne when Villeneuve came in on the wrong lap and ruined Jenson's day.Villeneuve later blamed radio failure. Webber was finally classified seventh with Trulli eighth and Ralf Schumacher ninth. Ralf had one lucky escape. The two cars crossed the line at the restart of the race. The official time sheets and lap charts bear this out. The race was neutralized until the end of lap 22. On lap 21 Verstappen was 11th and Ralf 12th. A lap later Ralf was 11th and Verstappen 12th and there was a gap between the two men of two-tenths of a second. The only way that this is possible is if Ralf broke the rules. Luckily for the BMW Williams driver the Race Direction appears to have been too busy focussing on other issues to have noticed and so Ralf avoided a drive through penalty, the normal punishment for such an offence. The only other man to finish was Cristano da Matta but he was a lap down after several mechanical problems. The only man to break down was Nick Heidfeld in the Sauber. Ralph Firman suffered a less than impressive suspension failure on his Jordan and crashed into luckless Panis.